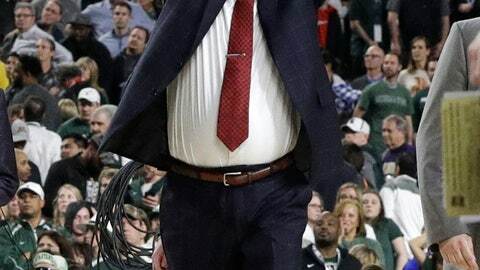 MINNEAPOLIS (AP) — The NCAA Tournament will take an ugly turn in its final or, depending on your perspective, be a masterpiece in defensive basketball. The national title game Monday night pits Virginia (34-3), the standard-bearer in lockdown basketball, against the new kids on the defensive block, the Texas Tech Red Raiders (31-6). The NCAA Tournament will have its first first-time champion since coach Billy Donovan won it all with Florida in 2006. The last time two teams who had never won a championship played in the title game was Michigan State against Indiana State in 1979. That’s right, Magic Johnson vs. Larry Bird. Virginia had two close calls to reach its first title game. The Cavaliers survived a scoring onslaught by Carsen Edwards (42 points) and forced overtime on Mamadi Diakite’s short jumper to beat Purdue in double overtime in the Elite Eight. Virginia had another nail biter in the Final Four, beating Auburn 63-62 on Kyle Guy’s three free throws with 0.6 seconds left. Down 2 with 1.5 seconds left, the Cavaliers got the ball to Guy, who was fouled by Auburn’s Samir Doughty on a 3-point attempt. He sank all three free throws to send the Cavaliers to the title game. Texas Tech outmuscled Michigan State 61-51 in its Final Four game Saturday night, but saw Tariq Owens roll his right ankle in the second half. The shot-blocking senior returned after taping his ankle up, but Red Raiders coach Chris Beard declined to give an update Sunday. Playing without Owens would be a huge loss for Texas Tech. Should Virginia win Monday night, it will likely go down as one of the biggest turnarounds in college basketball history. A year ago, the Cavaliers became the first No. 1 seed to lose to a No. 16 when they were knocked off by Baltimore-Maryland County in the first round. Virginia has used the historic loss as motivation all season and is on the cusp of erasing it with the biggest victory in program history. Virginia is led by the three-headed monster of Guy, De’Andre Hunter and Ty Jerome. Guy hit a late 3-pointer before the three massive free throws against Auburn. Jerome was the catalyst early against the Tigers and finished with 21 points. Hunter came alive after quiet first half, finishing with 15 points. Texas Tech’s trio of Jarrett Culver, Davide Moretti and Matt Mooney do the most offensive damage for the Red Raiders. Mooney was money against Michigan State, hitting three straight 3-pointers to give the Red Raiders a 10-point cushion. Culver took over when the Spartans started paying more attention to him, scoring six straight points to stave off a Spartans charge. Though quiet against Michigan State, Moretti can get hot in a hurry, as he did earlier in the bracket.